I had not exercised in more than two weeks, was eating tons of sugar, not sleeping well, clenching my jaw, had muscle aches, talking less and thinking way too much. I felt as if the walls were closing in and that I was suffocating. Life had not necessarily thrown me any curve balls that I had not dealt with in the past, but how I was reacting to these stressors had changed. I was simply not taking care of myself and was too busy trying to take care of everyone else and it was taking a toll on me. I was stressed to the max! 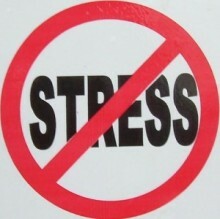 Stress is a fact of life and cannot be avoided. However, I believe that managing stress and self care works better than a reactive, “Oh-no — what-can-I-do-now” approach. A proactive approach to managing stress can make a huge difference. I think all too often we let stress build and it can rear its ugly head in physical manifestations, just as it has for me these last couple weeks. Posted August 29th, 2012 & filed under Health, News.